Following Fairleadgate, everything else went smoothly in Nazarè. We had some good long walks up to Sitio (right on top of the hill). We even eschewed the funicular (more due to Bella not being allowed on it than us being super-fitties or anything). 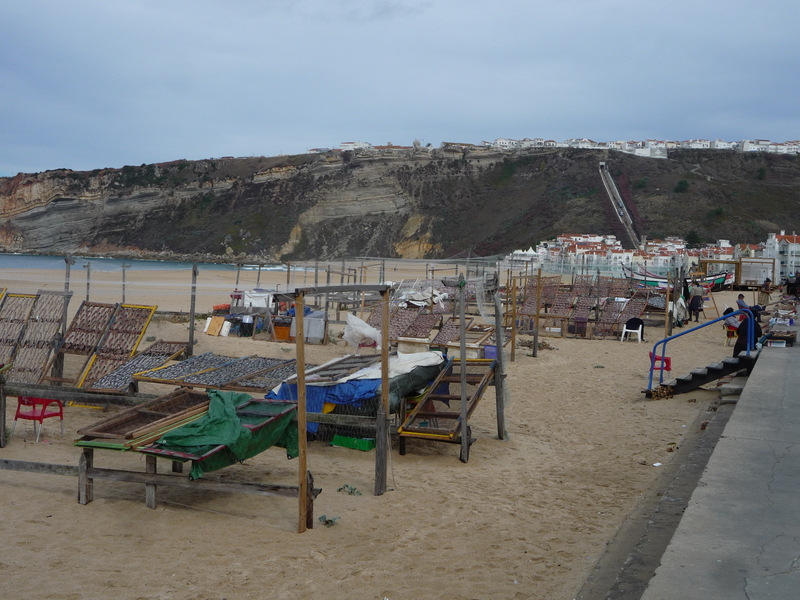 We got some great views over the Praia do Norte from the headland – the conditions were completely different from just around the corner on the flat-calm town beach, and there were lots of surfers out trying their luck on the breaking waves some way out. We couldn’t even imagine what a 100ft wave would be like, let alone seeing someone surf it! The weather was perfect (for those of you in colder climes, mid-20’s and wonderful warm sunshine…smug? us? 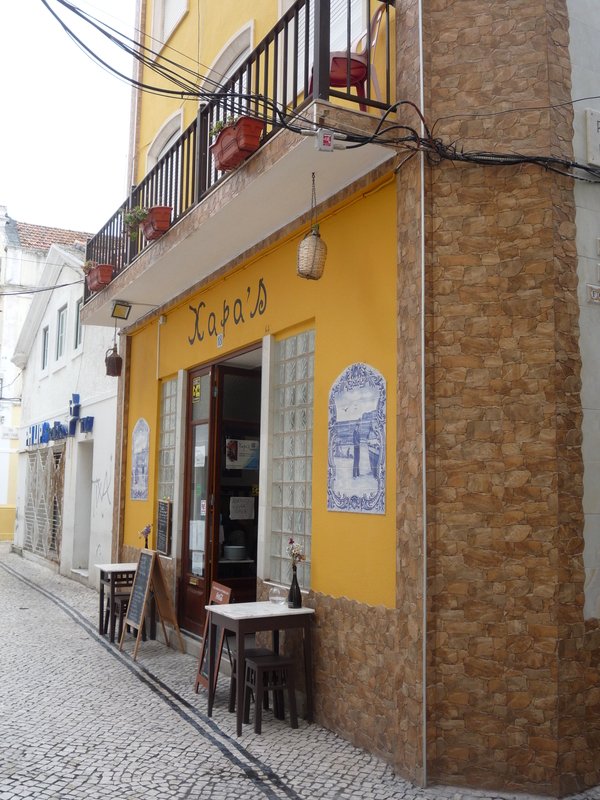 ), and we chilled out in the Sitio square overlooking the town and beach with some ice creams! The only downside is that Portugal recently passed a law prohibiting dogs (or any other animals) in all public buildings including shops, bars etc. Bad luck Bella! Although we did find a couple of pubs that were happy to flout the rules and let us all sit outside. Typical property, externally tiled to pavement level. We made some cruising friends (not as dodgy as it sounds) in Ulrike and Dirk from Germany on Mariposa – also cruising with their dog, Chica (guard dog supreme! ), as well as Torsten & crew from Norway on Wildensky – all cruising on student loans acquired to ‘study birds’…! We were invited to Uli and Dirk’s boat for a drink one evening, and got a tour of their self-built boat (http://www.sy-mariposa.info/index.php) – It’s a beautiful boat, and we were particularly envious of their engine room (Yes, an whole actual room. For the engine.) – we cooed our appreciation at the cleanliness and accessibility of the filters, tanks and fill points. Gosh – a far cry from Rose Rambler! They also had a washing machine on board, and a superb heating system – and ventilated insulation to stop any traces of damp! They had been up to Iceland, Norway, and the Faroes for several months, and the boat was certainly well kitted-out for colder cruising! A very enjoyable evening; this is one of the reasons we enjoy sailing! The smallest beer in the world at 200ml? We wondered what the point of that was! We certainly notice that our drinking culture in the UK is quite different from the Continent’s!! 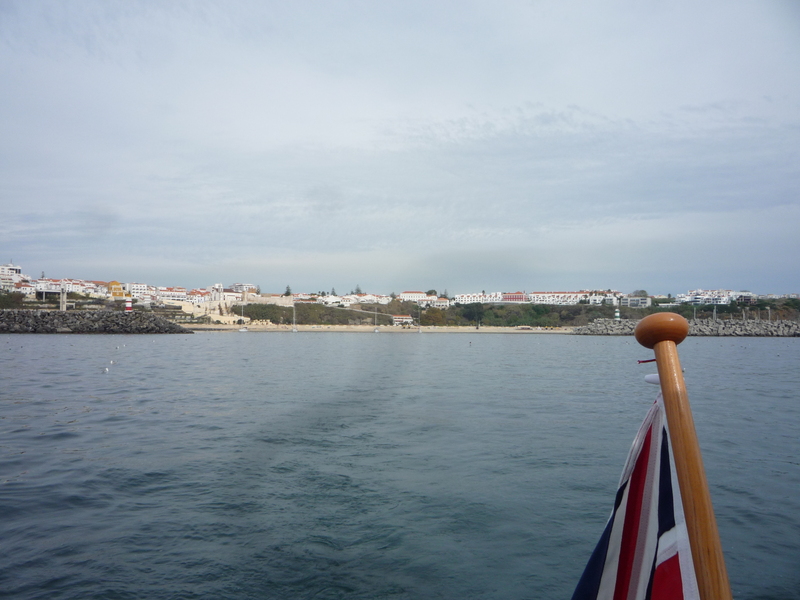 We wanted to make some progress down the coast, and the weather fronts had given us a good window, so we decided to do a 24-hour trip down to Sines (pronounced ‘sinch’. No, we don’t get it either) and stopped there for a night before moving on to Vilamoura which lies around the Cabo de São Vincente and in the Algarve. 24 hours seems to be long enough in one go – for any of us – and we really enjoy the night sailing, so it’s the optimum passage length really. We can cover about 120 nautical miles in that time, which also means a good bit of progress down towards Gibraltar. After Gib, we will be doing mostly short sails and day hops, anchoring for lunch etc and enjoying the Mediterranean weather… We hope the conditions there will (generally) be good enough to enjoy sailing through till summer, as well as fit some diving and fishing in. In summer, we hope to make our way back up the coast to the Basque region in northern Spain and visit all the places we missed on our race southwards with the weather. The trip was uneventful (which is just the way we like them), aside from Bella having a bout of seasickness. Unfortunately, this happened on the off-watch berth again, so the emergency sleeping bag that we deployed after the last indiscretion (when entering Portuguese waters) took another one for the team. We saw several boats passing close-ish by and gave them a wave, but otherwise all was quiet on watch. On approach, Sines looks quite industrial – a lot of chimneys and factory complexes to the north, but we only planned on staying one night, and the Pilot Guide assures us it is a nice town. We arrived in the morning and secured to the arrival pontoon which also handily happened to be the fuel pontoon so we refuelled at the same time to save a bit of time when we leave. 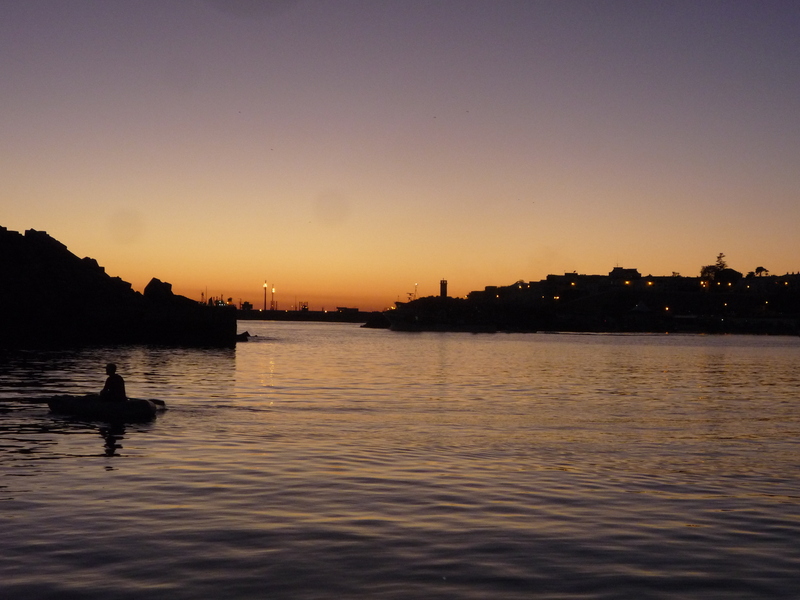 Sines is a small marina in a small town, but there has been considerable investment in the port facilities and it really showed – everything was well-kept and efficiently operated. The chandlery was small but well-stocked, the marina facilities were excellent, and there was even a shop selling a large range of diving and fishing gear. I asked what the diving was like in the area, only to receive the reply ‘the diving’s good, but the spear fishing’s better!’. We resolved to buy a spear gun! Later in the afternoon, as well as the following morning, we saw several people kitted up for spear fishing, and a couple taking trophy photos of their (very successful) hunt! 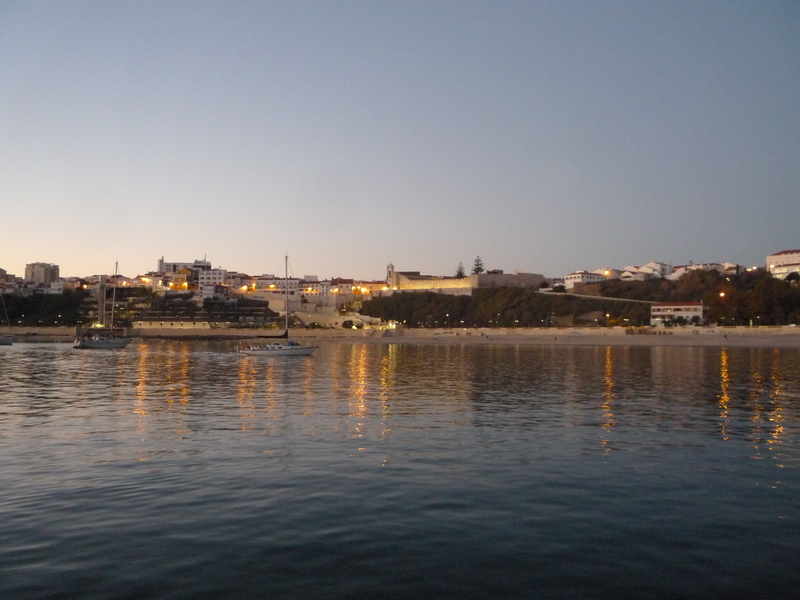 The town itself was really nice – the castle (which actually just seems to be the castle walls) overlooks the port and beach area, and the town has lots of small alleyways and plenty of places to sit and have a coffee or beer. We also did our normal trip to stock up on groceries as we planned to move on further. The weather has held well; still lovely and warm and sunny – we hoped it would continue as we headed south to the Med! No sooner said etc… We left Sines marina just after lunchtime the next day (having planned, obviously, to leave around 10am…) and it was distinctly overcast! We started off in t-shirts and shorts, but this quickly turned into jeans and a jumper as we got further underway! I took the first night watch, just as the rain started… By the time we had turned around Cabo de São Vicente, it was raining fairly steadily and we had actually taken to using the watch seat (just inside the cabin) and hopping outside to the cockpit for a look round every once in a while. 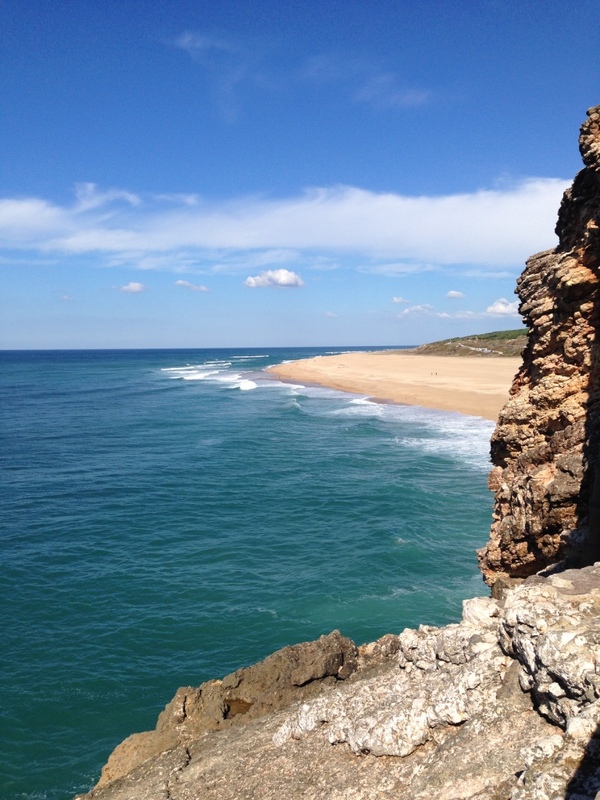 There had been a fog warning on the NavTex, but we didn’t see any… just more rain… Welcome to the sunny Algarve! Or not. 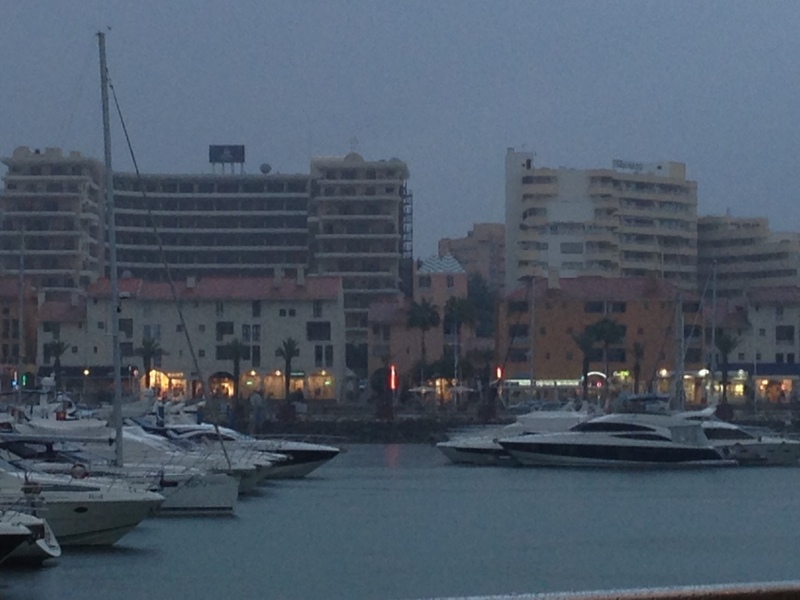 We approached Vilamoura late morning, still in the rain. We moored up on one of what they probably class as their ‘play boat’ pontoons – we had to pass plenty of 30m+ motor craft on the way to our berth – many British flagged (and of those, predominantly London-registered with names such as ‘Capital Gain’ and ‘Blue Chip’ etc). Classy it ain’t! Vilamoura is a large purpose-built resort that is somewhat overpopulated by Brits and Irish and we felt a bit like we had sailed into the middle of a ‘new money’ version of Butlins. That said, we won’t want for Irish bars or English breakfasts for the next week! In fairness, it is a nicely kept resort with plenty of places to eat and drink. The marina itself isn’t dreadful – the staff are friendly and facilities are ok (although the showers and laundry are located, somewhat bizarrely, behind the waterfront bars and restaurants, so walking to/from the showers at any other time than first thing in the morning when it’s quiet is a bit of an odd experience!). They also have the least-awful wifi we have discovered in a marina to date – for some reason marina wifi is always unreliable (if you can even connect to it in the first place), slow, and generally pretty bad, however Vilamoura seems to have found the key to providing a semi-decent service! I guess those City boys still need to buy and sell from their bathing decks. Over the next few days the weather was mixed; we had thunderstorms, lightning, sunshine, and downpours – in absolutely any order. The barometer was up and down like the proverbial, and it was hard to tell what the next day would bring, so we made use of the sunshine to do some boat jobs and take some walks, and made use of the rainy days to chill out. We found a supermarket selling bacon at extortionate prices (over €6 for 8 slices! ), Heinz baked beans and ketchup, as well as some 80’s favourites (vol-au-vonts and Mateus Rosé), but we left all of these delicacies on the shelf in favour of one Brit import: Robinson’s squash! In fairness, we had brought a good supply of things such as ketchup and english mustard with us, but it seems that the Spanish and Portuguese don’t really go in for squash – we assume due to the abundance of fresh fruit juices, but it’s probably the ‘taste of home’ we miss most (although we haven’t run out of tea bags yet….). We went out for the evening and left the boat to the mercy of Bella (aka Chewy…). 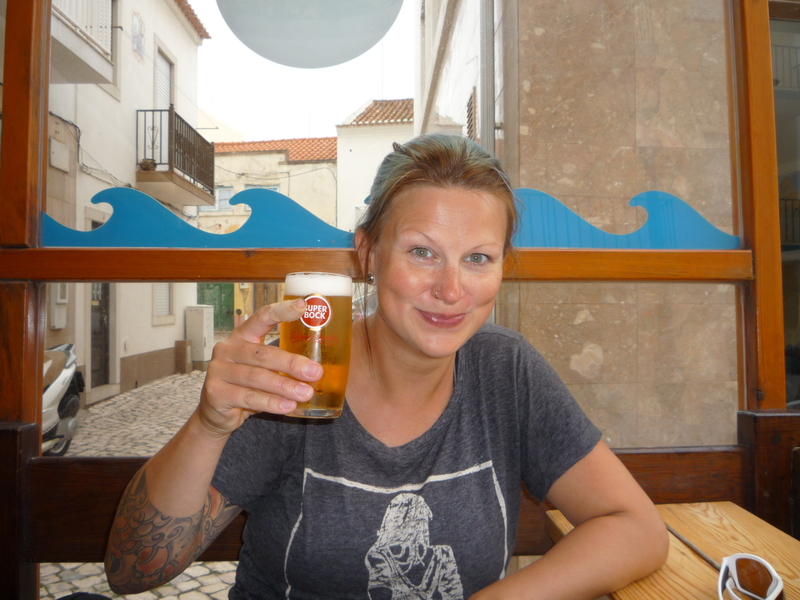 We found a bar serving pints of Sagres for €2, then tried a new restaurant called Salmora Live Kitchen which was simply amazing! 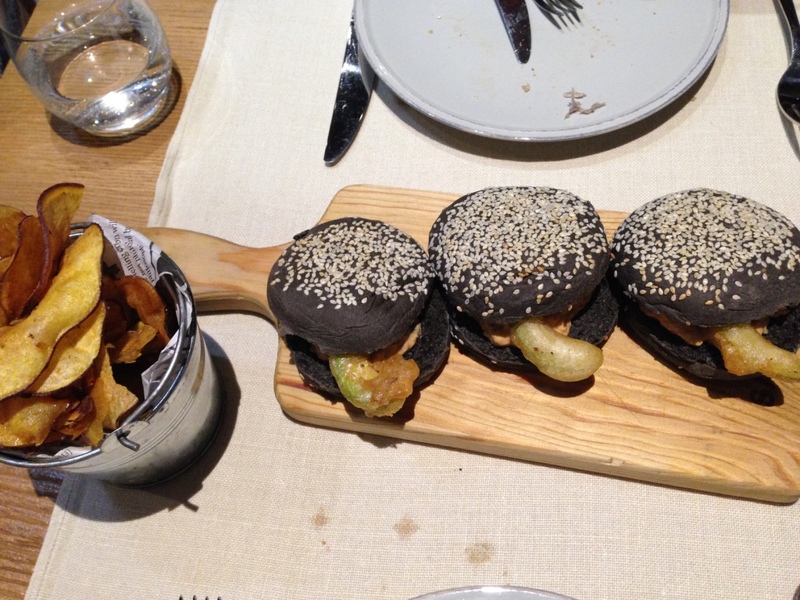 We try to go for a meal in each place we visit, and this place was fantastic – the staff were friendly, the décor really innovative but not ‘too’ cool (the electric doors into the loos nearly had us flummoxed though), and the food was absolutely excellent – mackerel ceviche, crab burgers in squid ink buns, baby squid and lemon mayonnaise, seared tuna etc. 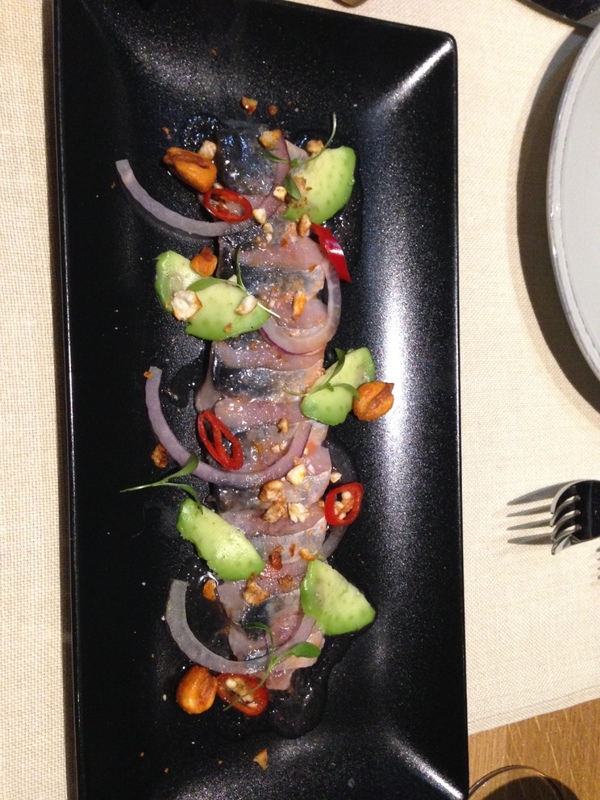 The price for this evening out was merely a chewed book cover and pencil…. We also met a French man, François, who has a Nicholson 38 moored just along from us on the pontoon which he had owned from new (45 years!) – he kindly gave us a tour of his boat, taught us some new knots, and also give us some good ideas for places to go (and avoid) on the way to Gibraltar. He then sent us off with a small wooden device for the boat (which we still haven’t quite worked out on what occasions we might use it, despite his demonstration) and a bottle of local white port! You meet some amazing people cruising; many a bit bonkers, but almost without fail astoundingly helpful and kind. We also found an excellent chandlery and invested in a very cool gadget – one so cool it deserves it’s own post, so stay tuned! We felt we really needed to leave. We had begun to feel we were wasting both time and money here; rather than relaxing, we were getting worried about our progress and our budget. We resolved to take the first good weather day and get out. Then the rain started. It started around 10pm, just as we had turned in for the night. And boy did it start! It continued solidly through the night, and the two-minute early morning toilet walk for Bella at 6am resulted in us both getting absolutely drenched. Windguru forecast 24.3mm/3hr – the most I’ve ever seen on their forecasting – and it was to carry on all day! Jamie took the wisest course of action, and decided on a lie in. I sat up reading, but was soon distracted by the sound of dripping water. Inside. It couldn’t be! RR had been so watertight! In an almost Swiss way – functional and understated, but stoically and trustworthily watertight. What had happened in the face of this Algarvian rainstorm? I located the source of the drips – the head lining (the ceiling, if you like) in the galley. Just the odd random drip, just a bit annoying. I stuck a bit of kitchen roll down and went back to my book (Foxbat, by the excellent James Barrington, if anyone’s interested…). Soon it was clear that the kitchen roll was not man enough for the job. I deployed a tea towel in its place. And then a small receptacle. And then a pie dish. Then the second leak started around the corner… You can see where this is going. Jamie popped his head around the door, so I said we had ‘a bit of a leak, nothing serious’, although it was starting to get a bit annoying. By now I had 4 receptacles dotted around, and a couple of sodden tea towels. I took the head linings down and located the point to which water was tracking (and thence spreading itself around the galley before dripping out – although by now it was more constant than the word ‘dripping’ would suggest). It was somehow getting between a bond of fibreglass and timber – again, something to check in Gib. Possibly a failed seal on the coach roof, or a poorly mounted deck fitting. It was the most rain I think we’d experienced in our time on board, so we could allow a couple of little leaks… The rain finally died off around 6 that evening, after a good 20 hours of relentless hammering. It rained again the next day too, but only in a ‘normal’ British sort of way. And the next. We had only had a couple of good days since arriving, so that – coupled with our other frustrations – was getting a bit tiresome. On exploration outside, Jamie reckoned the leak came from the cowl vent – turned into the driving rain and simply open to the GRP below. It went on the Gib ‘to do/check’ list! We did manage to get out and see the superb rugby final (especially superb for those of us supporting the Kiwis!). We took shortish walks in waterproof jackets, but otherwise stayed on the boat, reading, cooking, and doing little jobs. Next stops: Andalusia and Gibraltar! Next Post14. Well hello, Andalusia!